We are very proud to inform you that the Undergraduate Pathology quiz competition was a great success. 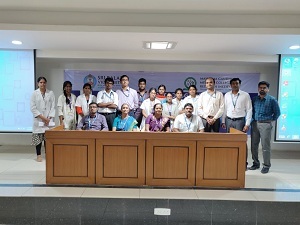 Our undergraduate MBBS students participated enthusiastically and made this a mega event. 21 teams (two members per team) participated in the preliminary round held in the department of pathology between 8.30 to 10.30 am. Out of which, 5 teams qualified for the final round. A final round quiz was held in Vikram Sarabhai hall, third floor, College block between 2.00 to 4.00 pm. We the organizing team, thank you all for extending your support. A special thanks to the active students and the management for making the program a grand success.